... about which you should be apprised. 1. 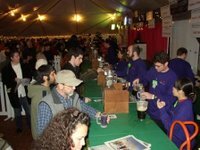 Gary Corbin, a long-time Portland beer guy (writer, homebrewer, drinker), has begun his own blog. Wine creeps into some posts, but don't hold it against him. 3. A guy sent me links to three videos that feature a tour of Belgian breweries. They're part of a series called "Thirsty Traveler," they're professional (as opposed to, ahem, some online beer vids), high res, and pretty fast loading. And they're cool. First, Second, and Third in the series. (First two are the best.) Seriously, if you love Belgian beer, these are worth a look. The last three weeks have been relatively unbeery as I made my way from India to Hong Kong ... but not completely so. Never mind India Pale Ales, the subcontinent is a dead zone for beers. Once Mountbatten left, so did all the good beer (actually, I have no idea how long the Brits continued to line their hulls with ale). With names like He-Man 9000 and Knock Out, you devine quickly what the Indians are after. (There's an export market for beers made but not available there, but that's a different post.) In any case, I skipped the He-Man. On to Hong Kong, famously urban and urbane city where the night life hums with action. 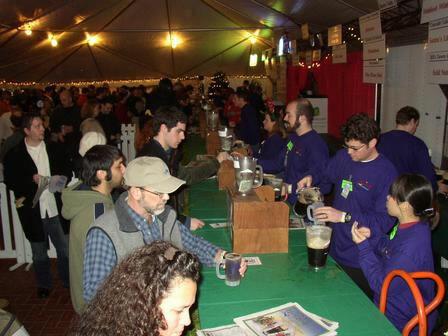 No doubt a haven for at least one local brewer, right? No. There are exactly zero breweries on the island--except possibly for a brewpub, mentioned only obliquely (and without an address) in my guide book. You'd think that a former British colony would have beer, but in this case, you'd be wrong. Locals drink San Miguel, the poor Filippino beer, or hard liquor. Since San Miguel is available here, I skipped it, but did decide to pop into a grocery store to see if anything interesting was available there. Turns out China has a number of breweries, and a few products are shipped to the Island. If you've been to Asia or tried Tsingtao (pr. "Ching Dow," at least on local commercials), you're probably familiar with the pale, very light lagers generally available. That's the case with the two Chinese beers I tried, one from Dali (大理啤酒) and another from Shenzhen Kingway (金威啤酒). 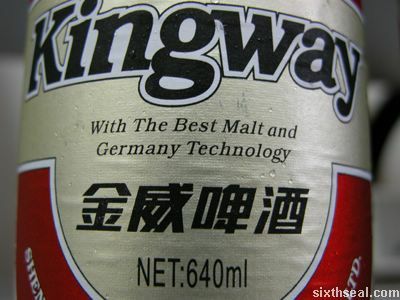 Kingway had a boring label, but beguiling copy: "With the best malt and Germany technology." Reading a little further, I found that rice was one of the ingredients--just like they make it in old Berlin. The beer was incredibly pale and light bodied. It was the closest I've ever had to tasting flavorless beer (Bud might take note). It was crisp, though, and had no cheap, offensive flavors. It may well have had no alcohol, either. I bought the Dali Beer because the label was wholly in Chinese (I'll try to get a pic--I dragged the bottle home because it was so cool). The brewery is named after the city in Yunnan Province where it's brewed, and they apparently produce a number of different beers. The one I got was called "Wind, Flower, Snow, and Moon," which is apparently also a nickname for the city. The beer reminded me a lot of Singha, with that characteristic yeast note it has. Call it metallic, but in a good way. (Singha is one of my favorite pale lagers.) It was slightly soft and floral, and a rather nice beer. It was also surprisingly cheap--just a buck for a large bottle (seven dollars Hong Kong). The prettiest and the cheapest, and a good beer to boot. Cool. Two other beer-related discoveries. There was a Turkish restaurant in the little town we stayed in (Mui Wo on Lantau Island) that had Efes Pilsener. Another very nice pale lager, and apparently the Budweiser of Turkey. It has a slightly sweet, noticeably hoppy palate--more character than I'd expect from an industrial beer, and better than anything you can get in a can in the US. Finally, the little corner market also stocked the original Budweiser from Budvar, and so I picked up a bottle for the collection. And no US warning label! I'm off to India, returning Thanksgiving Day. I'll be at a Buddhist monastery in the Indian Himalayas, far from anything resembling beer or an internet connection, so this site will go quiet for a bit. I've got a cool documentary that the Blitz-Weinhard Brewery used to show before brewery tours. Now the brewery is gone, but these remain. Enjoy--I'll see you after Thanksgiving.